You’re walking down the aisle. All eyes are on you. Your heart is pounding. It’s your big day at last! Once you’ve found your perfect wedding gown, it’s essential you have it altered to fit your body perfectly. At Blue Bridal Boutique in Denver, we can help. Our in-house seamstress can ensure you get the perfect fit — even if you didn’t buy your wedding dress with us. 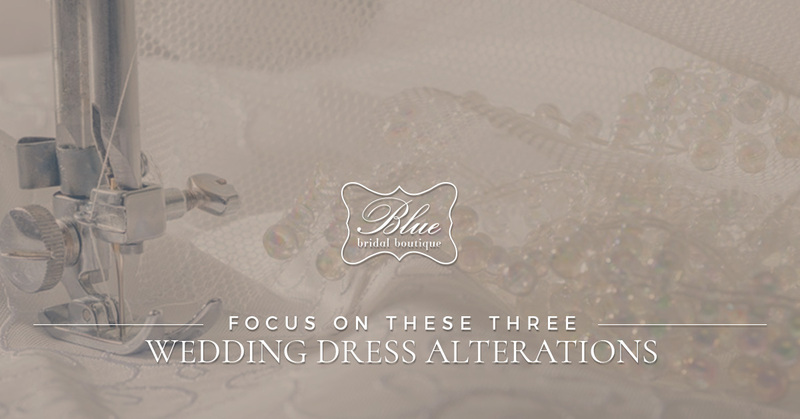 Our blog today focuses on three essential wedding dress alterations. Of course, our bridalistas and seamstress can always work with you to do more drastic alterations to get you the look you want. The ideal length, unless you’re going with a mini or tea-length dress, is one where the hemline will just barely graze the ground. When your wedding dress grazes the ground ever-so-slightly, you’ll have the most mobility possible — for all that dancing, greeting, and walking around! — without being at risk of staining or tripping on the dress. Doing this might be easier said than done, though. You’ll have to determine your wedding shoes in advance, have them with you when you get wedding dress alterations, and know what kind of floor you’ll be walking down. Are you having a farm elopement where you’ll be on soft ground, a beach wedding where you’ll be on sand, or a formal wedding where you’ll be on a hard surface? Dress alterations on your waist will be largely determined by your undergarments. We’ve all experienced the sweet changes that come with Spanx, have we not? If you’re wearing shapewear on your wedding day, you’ll certainly want to wear it when you visit us for dress alterations. 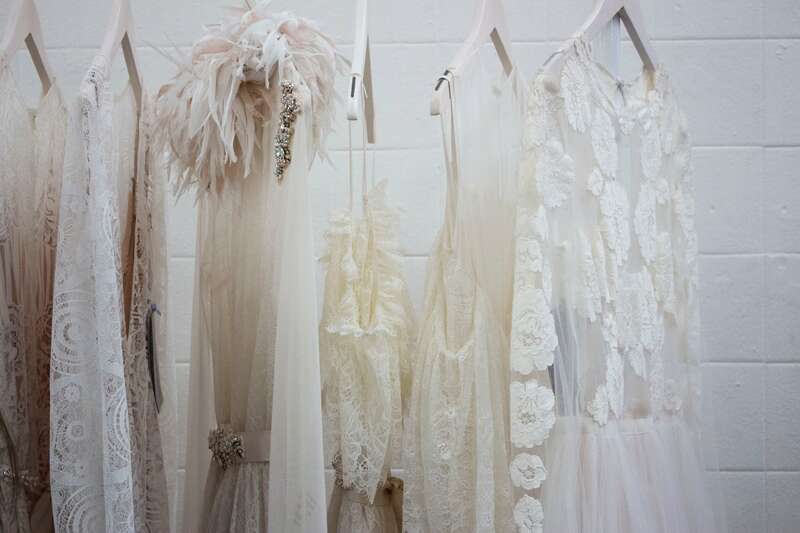 There are key tips when it comes to wedding dress alterations. One of these is to pay attention to your weight, which can affect the size of your waist. We’re not saying you need to shed pounds before your wedding; we’re simply saying to be aware of your weight and not to plan on losing weight when you get alterations. Even if you’re perfectly on track for your wedding diet, you never know what will happen. You want to show just the perfect amount of cleavage on your wedding day, and dress alterations will be instrumental in ensuring you do so. If the dress has too high or too low of a neckline, we can help get it just right. There are two things many women don’t think about regarding the neckline on their wedding dress and alterations: jewelry and undergarments. If you’re planning on wearing a necklace when you float down the aisle, will it compete with your neckline? Will it be the right length? A seamstress can help you make sure it’s perfect. When you plan your wedding dress alterations, make sure you wear the same bra you’ll wear on your special day. A good bra can make a big difference — so be sure to wear the right one. Here at Blue Bridal Boutique in Denver, we’re thrilled for you and your wedding day. Let us help get everything right — from the wedding dress style to the alterations to the bridal veil. Contact us today.